The show’s producers and the TV networks were so thrilled with the first season in Singapore in 2018, the sequel was a no-brainer. The thrill of the first ever meeting between leaders from the United States and North Korea — and these two leaders at that — merited round-the-clock coverage. The media was blanketed with breathless analysis for weeks on end, and on the day of the main event analysts in capitals across the globe stayed up all night to watch it live. Who could resist? What will happen in the second season? 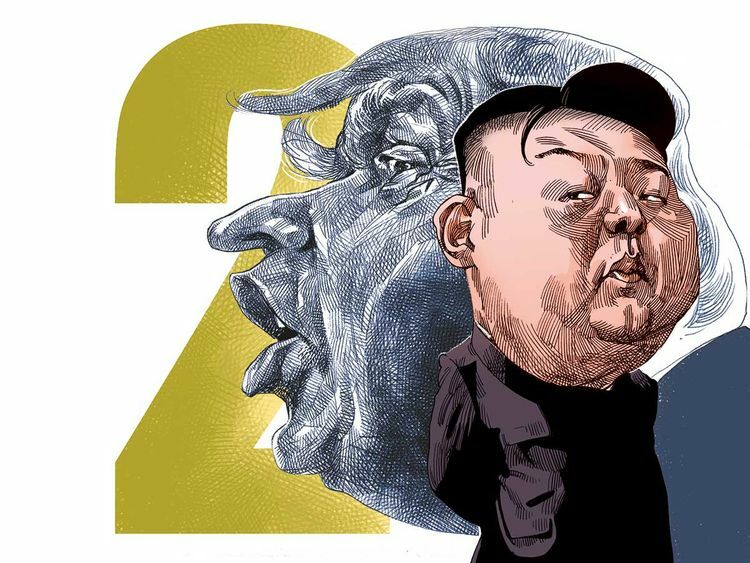 Will Trump get Kim to give up the nukes? Will Kim keep rebuffing Trump? Will they strike a good deal that breaks the decades-long deadlock? Who knows! That’s why it’s such a guaranteed success — the world will be watching either way! Trump knows his audience. Progress or no progress, he thinks he controls the narrative. At least these talks aren’t being done in secret, like those talks President Barack Obama’s administration held with Iran that actually secured a deal to prevent Iran from getting a nuke... Those were so boring. Sarcasm aside, it’s hard to take Trump’s attempt at diplomacy with North Korea (or anyone else, for that matter) seriously, as Trump disregards facts, advice and the interests and norms that keep America safe. But the stakes are high, and deadly serious. Or, maybe not. Maybe North Korea is just buying time to relieve sanctions and expand its arsenal. Maybe Trump only cares about making his engagement with North Korea look like a success. Maybe Trump will agree to a bad deal that plays well on TV: Trump brings all US troops home from South Korea (which he has repeatedly indicated an interest in doing) in return for vague promises of denuclearisation. And this time, there’s no more Secretary of Defence James Mattis or Chief of Staff John Kelly to try to stop Trump from agreeing to a crazy deal. So far, there’s little evidence that this process will be successful. North Korea continues to advance its nuclear weapons and ballistic missile programmes. Even since the Singapore summit, North Korea has resisted engaging in the working level talks necessary for any deal — US special representative for North Korea Steve Biegun only met his North Korean counterpart days ago, after the second summit was confirmed. At least it’s better than “fire and fury”, right? At least we’re not at war. Sure. Compared with war, everything looks good. But the spectre of war with North Korea was created by Trump. When Obama left office, conflict was highly unlikely — although dangerous, North Korea has no interest in starting a war and the United States, and its allies have long contained and deterred North Korea. But Trump changed that, threatening to start an unnecessary war. For those who thought it was just bluster, Vincent Brooks, the former commander of US forces in South Korea, recently made clear just how close we were to war. Despite personally heightening the risk of conflict, Trump wants everyone to believe that he saved America from war, as he tweeted after the Singapore summit: “There is no longer a Nuclear Threat from North Korea.” In reality, Trump is both the arsonist and firefighter. While the chances of success are low, diplomacy with North Korea is necessary — it is the only way that the United States and its allies will address the threat from North Korea. The South Korean government is moving ahead with talks with North Korea, and the US must support its ally in Seoul. I have repeated these lines more times than I can count in the last year, and they remain true. But we must also recognise that, to date, Trump’s approach is not addressing the problem. Kim ceased testing of nukes and missiles before Trump agreed to diplomacy. Since the diplomacy began, North Korea has only dismantled a test site while continuing to expand its nuclear and missile programmes. Even without major breakthroughs it would be nice to believe that this diplomacy could continue indefinitely and keep the hope of progress alive. Genuine incremental progress — probably the best-case scenario — would be great. And the likely outcome of the second summit is more promises that keep the process going, but uncertainty around tangible progress and implementation.